The latest in a series of posts based on messages in Luke that we are currently preaching at the Ebenezer Regular Baptist Church. We now come to Luke 5:36-39, which has proven to be a knotty problem for many a theologian. What are the garments? 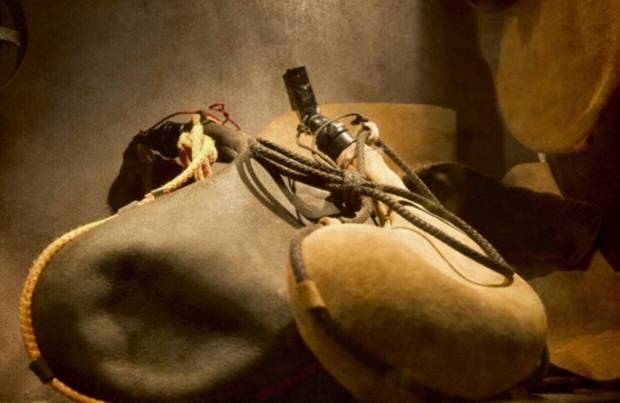 What are the wineskins? What is Jesus talking about here? As with any passage, a number of things have to be taken into account. And with difficult texts, it is often helpful to get back to the basics of biblical interpretation. The human author of this passageis Luke, and the most relevant aspect of his life – from a hermeneutic perspective – is that he was a long-time companion and disciple of the apostle Paul. Thus we can expect pauline themes throughout his writings. The intended audience of the book of Luke is gentile Christians, personified by the immediate recipient, Theophilus. The immediate recipients of Jesus’ teaching include Pharisees, and, according to Matthew’s account, disciples of John the Baptist. Their presence (Luke also mentions them) is key here, I believe, but more about that later. The immediate context of the text is a series of events that have one thing in common, the presence of, and debate with, the Pharisees. It is likely that these events did not happen chronologically as they are presented in Luke. This means that, inspired by the Holy Spirit, he put them in that particular sequence for a reason. When I study, I like to lay the text out in ways that are easy to visualize. I find it helps me get an overall grasp of what is happening, as well as place individual events into their proper context. So, as you can see, 5:36-39 is right in the middle of a section of several different literary genres that have as their unifying factor a continuing and escalating conflict with the Pharisees. 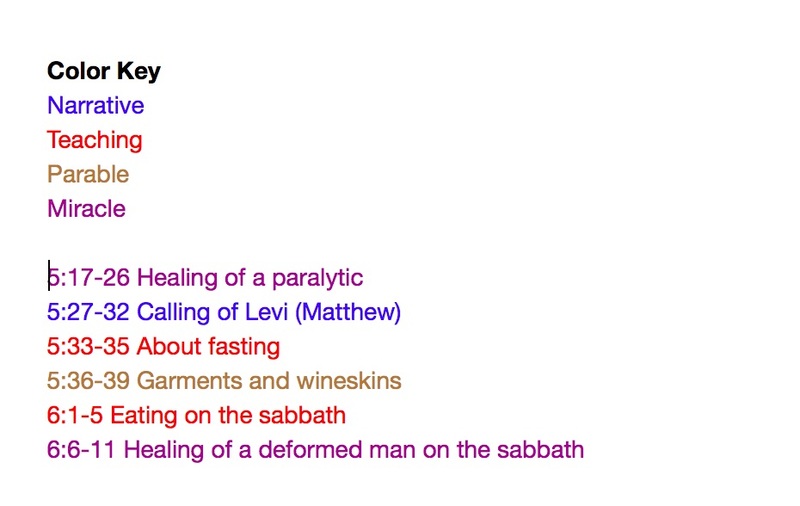 It is also a sort of didactic addendum to teaching on fasting – an illustration tagged on to the end of a sermon, if you will. Jesus gets asked by some disciples of John (Matthew tells us is was them who did the asking) as to why his disciples didn’t fast. Jesus initial answer (see our previous devotional) is that fasting is not a sign of spirituality, but rather a natural reaction to events. He then goes on this riff about old things and new things (using cloth and wineskins as an example), and how the two are incompatible. This, I believe, is still directed at the disciples of John the Baptist. Remember that John was a transitional figure, bridging, as it were, the gap between Old Covenant and New Covenant. And there is the point of the text. Jesus is telling the disciples of John that they will need to make a clean break from the old to the new. They cannot try to mix the two, they cannot go on equating rituals (like fasting) with spirituality. Once the Law has led them to Christ, they must set it aside and follow Him. That truth would have resounded with Luke’s Gentile readers (Jewish rituals were not required for their conversion) and it should resound with us as well. Our position with God does not depend on the observation of rituals or formalities, it depends completely on the finished work of Christ. And what was that “other Gospel”? Why is it so easy to fall back onto works? Because works can be measured. Works can be “done”. Works make us feel good, at least temporarily. Works appeal to our pride. And so we prefer the old wine of the law, or at best try to pour the new wine into the old wineskins.